This is the first of a fifteen post series, entitled "15 Days to Writerly Awesome in 2015." Good Morning, pretty people! Get yourselves a cup of coffee and prepare for some valuable, writer lessons. It's the first Monday of the new year, and with that, the beginning of my first blog series called, "15 Days to Writerly Awesome in 2015." With several guest posts from my much cooler friends, we're going to write ourselves into awesomeness this year. Ready for it? Hooray! I always start of the new year with a million good wishes, plans and strategies. Some of them stick, while some of them do not. Last year, I made this writing calendar, which turned out to be good in theory, but a bit difficult to keep up with consistently. However, I made a few concrete resolutions that I not only kept, but exceeded. This year, I plan to publish my book. I couldn't have reached this point without a dedicated, conscious commitment to writing daily. There are a few ways to go about doing this. Let's walk through them together, shall we? For me, it's easier to put myself to bed thirty minutes earlier than to pull myself out of it in the morning. It all comes down to what works for you. There are a few options for you: a weekly word goal, that lends itself to some flexibility. I'd say about 5,000 words a week at minimum. A daily word count goal is also a good thing to shoot for, but can be a bit more difficult to manage. If you write a page a day, you could have a novel in a year. And chances are, when you get started writing, a page just won't be enough. You writer machine, you. "I'm going to sit here and write for an hour and I'm not leaving this chair until I do." This kind of writer is a habitual person, and most likely pairs this with strategy #1. Kudos to you, my timely friend. This strategy works as long as you hold yourself accountable. The problem I find is that structuring your writing time around, well, time itself can make your word count fluctuate. Try your best to not squander your first thirty minutes staring at a blank screen. I suggest pairing this strategy with the sprinting technique. "I will sit here and write as fast as I can for thirty minutes" is usually a much more effective method. Still with me? Did your forehead just fall on the keyboard? Deadlines are not a negative thing. They're simply a means to an end. "I plan to write three chapters in the next week and a half." It's an incredibly effective way to hold yourself accountable, especially if you tack on some kind of reward or consequence to it. "I will write 2,000 words by next Tuesday or I will have to go a week without coffee." If that doesn't scare you, involve a friend. Have someone that expects your pages/chapters/words by that date, even if they're not actually going to read it. You feel a lot more pressure when there's someone waiting on the other side. Discussion Time: How do you plan to make the most of your writing time in 2015? 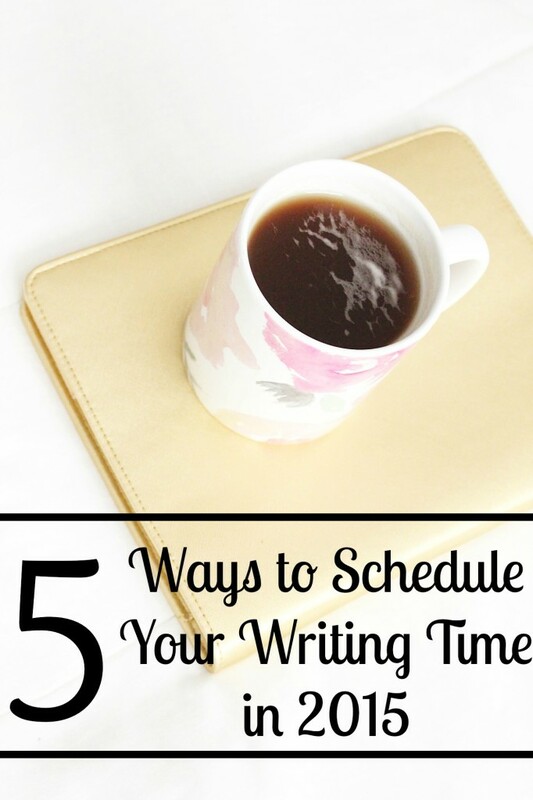 What's your favorite way to schedule your writing time?